Savelberg Cosmedical, distributeur in schoonheid. 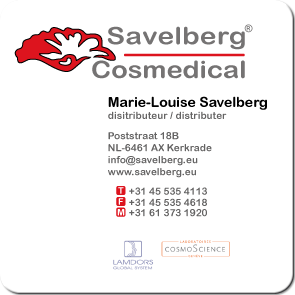 Savelberg Cosmedical operates as a distributor in the Benelux and focuses on the sales of skincare products, glycolic acid peelings, mesotherapy products, flexible canula and fillers. We offer the latest and most innovative products for anti-aging and skin care through our webshop in the future. Copyright (c)2011 Savelberg Cosmedical. All Rights Reserved.